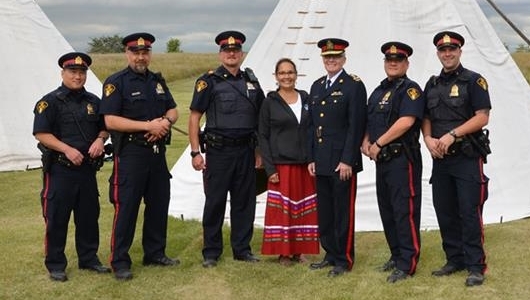 The Saskatoon Police Service Cultural Resource Unit (CRU) was formed in 1994 as the need was seen to form a stronger relationship with the growing Indigenous population that was in the city. This was all put forth in a collaborative effort by the SPS, Saskatoon Tribal Council, First Nations elders and the Federation of Sovereign Indigenous Nations. This arose after the Royal Commission on Aboriginal People’s findings clearly defined the disconnect with the justice system and Indigenous people of Canada. The CRU’s original mandate was building trust between police and Indigenous communities and facilitating the groups to be able to sit down and work together in dealing with issues of crime from a restorative and proactive approach, as opposed to an outdated reactive way of policing. Criminal activity was examined, and the issues of poverty, marginalization and racism began to surface as the underlying causes within the community all with connections back to Colonialism and the current trans-generational effects of the residential school legacy. Today, the CRU facilitates The Peacekeeper Cadet Program, the Race Against Racism and Saskatoon Police Advisory Committee On Diversity (SPACOD), as well as assisting with many other programs.